The clients are an active water-sports oriented family, deeply involved in offshore yacht racing and surfing. The location overlooks one of Australia’s most prolific surfing coastlines at Angourie. 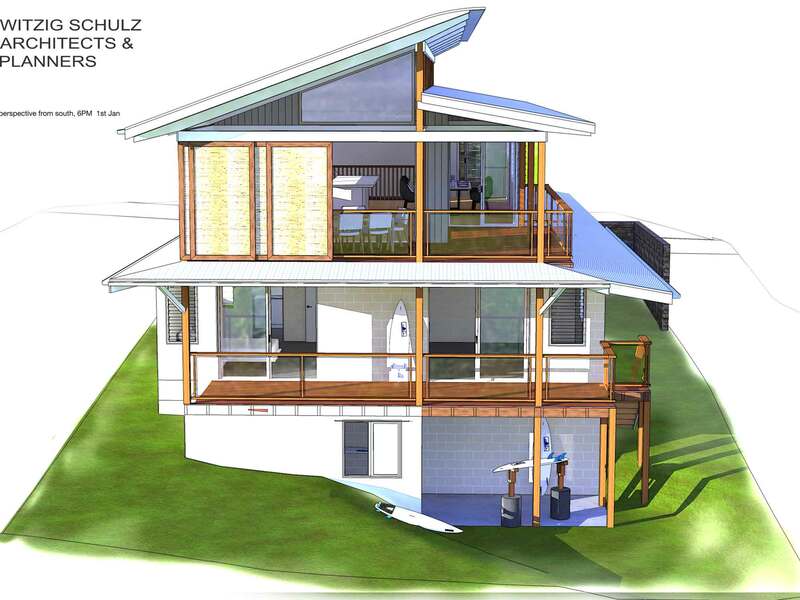 The brief for the house was to provide a great holiday house for the owners and their two surfing sons. The block has a north/south orientation with views cross the Yuraygir National Park to the southern back beaches. A check of prevailing surf conditions is easily made from the wide verandahs on the upper level. The structural form of the house is a skillon-roofed structure providing continuous clerestory lighting and ventilation to all upper level rooms and living areas. Wide verandahs provide indoor / outdoor living areas on both levels. A basement level surfboard shaping and repair room integrates the living and sporting functions of the beach-house for the longer term. Very efficient natural ventilation and lighting is provided to all bedrooms and living areas, which will require minimal energy use to provide an optimal beachfront living environment. Power will be supplied by grid-connected solar photovoltaic array. Rainwater will be harvested on site.